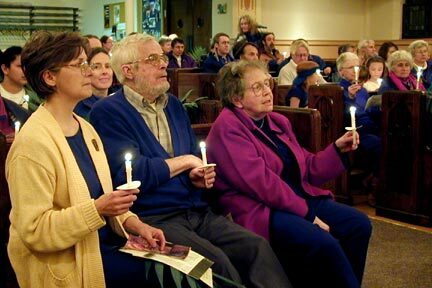 With great sadness, we relate that our dear friend and compañera Mary Swenson passed away on March 31, 2005. 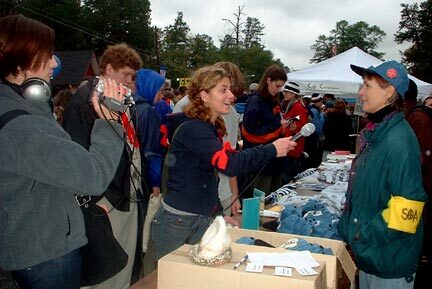 A very dedicated activist in the campaign to close the SOA, Mary co-coordinated media for the hunger fast begun on Labor Day in 1990 at the front gates of Fort Benning in Columbus, Georgia. She also conducted research on the School of the Americas in the SOA's own library at Fort Benning! Mary had courage and determination and was an inspiration and teacher to everyone she met. Those seeking guidance in the library at the Resource Center of the Americas were assisted with patience and expertise. Cancer may have consumed her body but it never touched her spirit... ¡Presente! 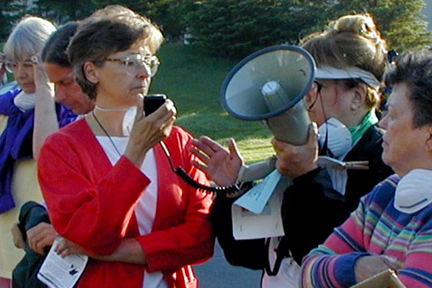 Just before Mary crossed the line at Fort Benning in Colombus, Georgia in a nonviolent protest of the training of soldiers from Central and South American countries at the U.S. Army's School of the Americas. 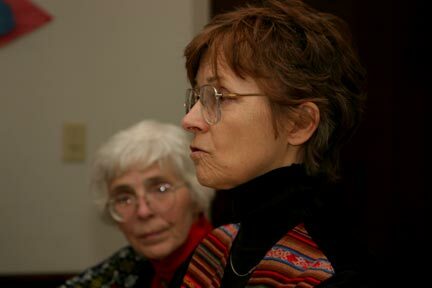 Participating in a "Depleted Uranium Speak-Out", Mary is at the headquarters of Alliant Techsystems in Edina. The Minnesota based weapons contractor is the DoD's largest supplier of depleted uranium (DU) munitions, which many leading medical scientists believe can cause cancer. The mask was symbolic of the dangers caused by the radioactive dust released by the DU penatrator upon impact. 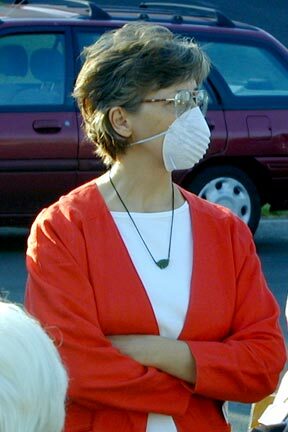 As an advocate for victims of cancer, Mary often spoke out about corporate pollution and its effect on both humans and the environment. A commemorative service for Salvadoran Archbishop Oscar Romero, who was murdered while saying Mass on March 24, 1980 by graduates of the School of the Americas. Seated with Mary are Patrick and Jennie Downey, also MnSOAWatch members. 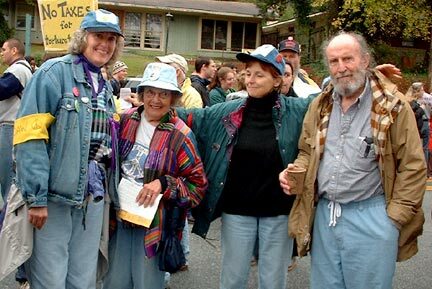 Fellow Minnesotans Pepperwolf and Tess and Bob Koenig join Mary in Georgia for the annual vigil. Always teaching, Mary is being interviewed by students from Benilde-St Margaret High School at the MnSOAWatch table at the annual vigil in November. Part of Mary's work in the campaign to close the SOA included lobbying our congressional representatives to pass a biil to close the SOA. 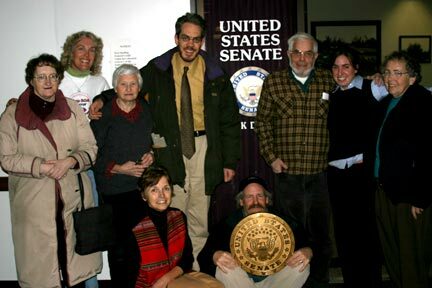 With members of MnSOAWatch, Mary visited Senator Dayton's office seeking an appointment with the Senator. Sister Betty McKenzie, former SOA Prisoner of Conscience, looks on while Mary explains to Senator Dayton the reasons the United States should not support a School of Assassins. 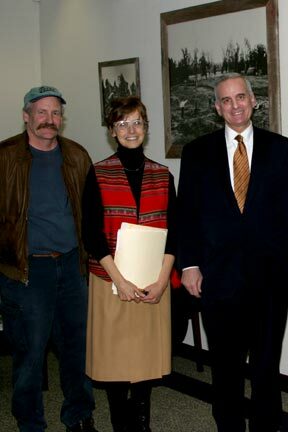 Bill Barnett and Mary Swenson with Senator Mark Dayton. Senator Dayton said after the meeting with MnSOAW members, and futher study of the issue, that he supported defunding the school. Another one of her congressional visits was with Senator Norm Coleman. MnSOAW had been granted fifteen minutes with the Senator and after a half hour his aids came in to end the meeting. 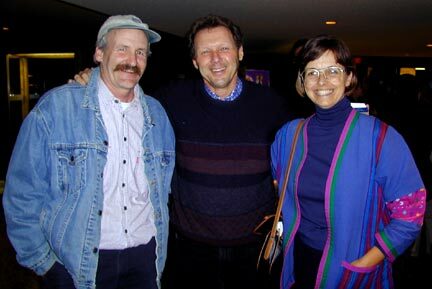 Bill Barnett, Father Roy Bourgeouis (founder of SOAWatch) and Mary. Roy was in Minnesota on a speaking tour and joined Bill and Mary at the pre-opening of the Resource Center's new facility. Voice for the voiceless, age 55 of Minneapolis. Very peacefully joined her dad Ray, brother Jimmy, nephew Matt and her grandparents in heaven on March 31st. Will be forever loved by her mother Pat; her siblings Rick & wife Janet, Kathy & husband Bruce Lindeman, Daryl & wife Rosie, Ellie, Patty & husband Mike Ludwig, and Theresa; nieces and nephews Mark & fiancee Traci, Megan, Danielle, Dain, Kevyn, Melissa, Natalie and Josh; aunt, uncle, and cousins. Mary will also be greatly missed by her kindred sisters, Jean, Colleen and Rhonda; as well as scores of best friends- too numerous to mention but you know who you are! 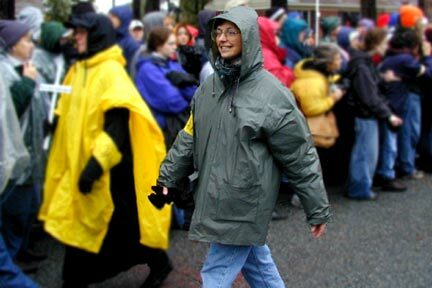 Mary spent her life as an activist working tirelessly toward peace and justice and advocating for God's poor. Memorial Mass Tuesday April 5th at St. Peter's Church in Mendota (Hwy 13 & 55) at 10:30 AM. Memorials gratefully accepted for Mary's favorite causes. Special thanks to Nurse Nancy and all those at HealthEast Hospice for their help with Mary's care in her final days.